Books for Babes provides info on the sort of comics that can be enjoyed by children and adults alike. This week we recommend ‘Blackwood’ TPB, out December 12 from Dark Horse Comics. by Stefania Rudd. Fun fact: At one point in time our spooky stories of ghosts and the supernatural were told around the Christmas season. (What did you think Charles Dickens’ A Christmas Carol was all about?) Over the course of history and its subsequent cultural shifts, the tales of hauntings and specters ultimately centered around the Halloween season — now we aren’t so inclined to tell that chilling story after we’ve downed our fourth glass of eggnog. But who says we can’t bring that tradition back? We could easily begin to do so with our annual gift-giving, and Dark Horse Comics is releasing the trade paperback of one of their most eerie series of the year, Blackwood, just in time for you to wrap it up and gift it to your favorite horror lover. This collection is made up of four issues that were published by Dark Horse over the summer, and the final product provides one clear, engaging, cohesive story. In Blackwood TPB, those issues feels very much like chapters in a book, and flow together so smoothly I think the wait after each issue for the next would have driven me bonkers. 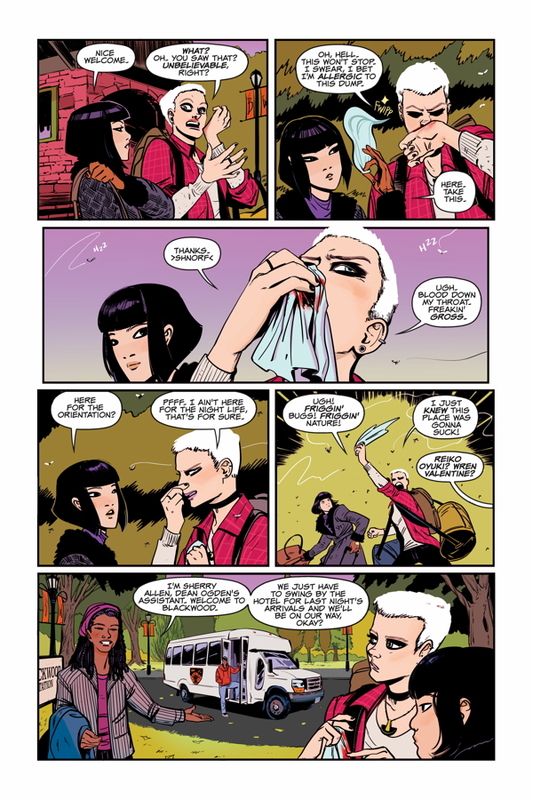 Of course that’s due to the excellent storytelling talents of writer Evan Dorkin (Beasts of Burden). 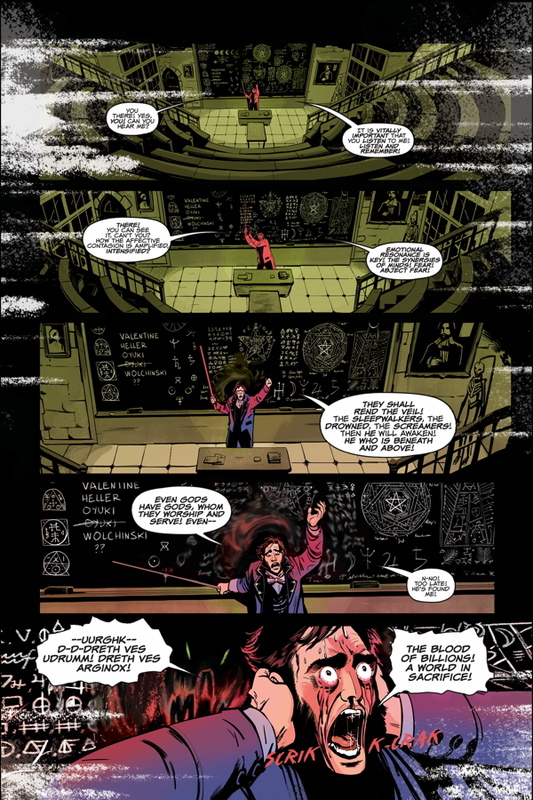 No stranger to the fantastic and paranormal, Dorkin tells the tale of a newly-arrived group of students enrolling in Blackwood College, a school known more for it’s programs in the occult than other, more traditional majors such as marketing or English Lit. 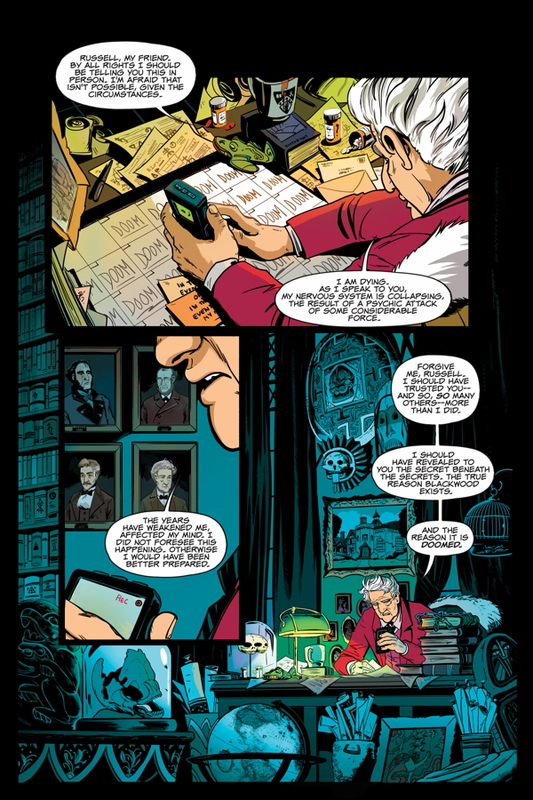 From the first few pages we immediately get a sense of that something is off, even when you take into consideration the mysterious operations of the school. 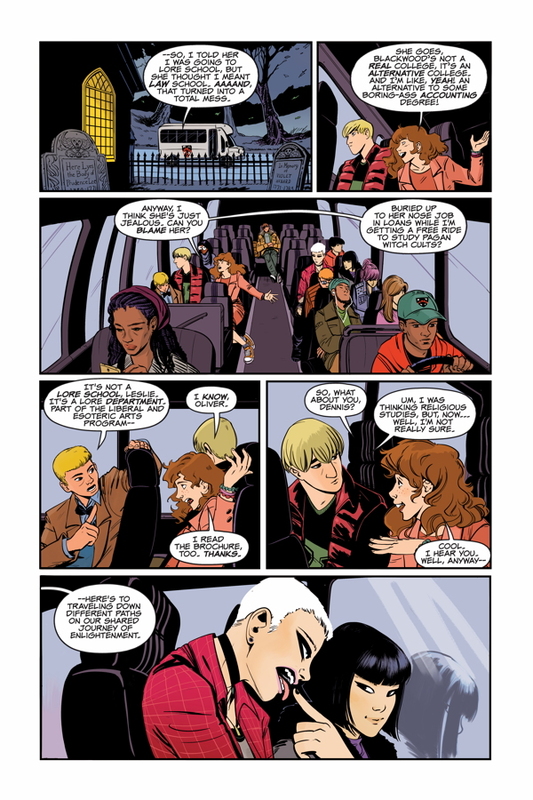 Over the series we learn our instincts are correct, and we learn this along with the story’s four central student characters, Wren, Reiko, Stephen, and Dennis. Each student has their own reason for being at Blackwood, and over the course of their time together they attempt to learn more about one another. To do this, they gather facts, make assumptions, and form opinions — oftentimes while trying to navigate other major dilemmas that keep coming their way, including a curse from Blackwood’s undead dean, a plague of insects, and a powerful witch. It’s way more intense than any of the team-building activities I had to do during freshman orientation. 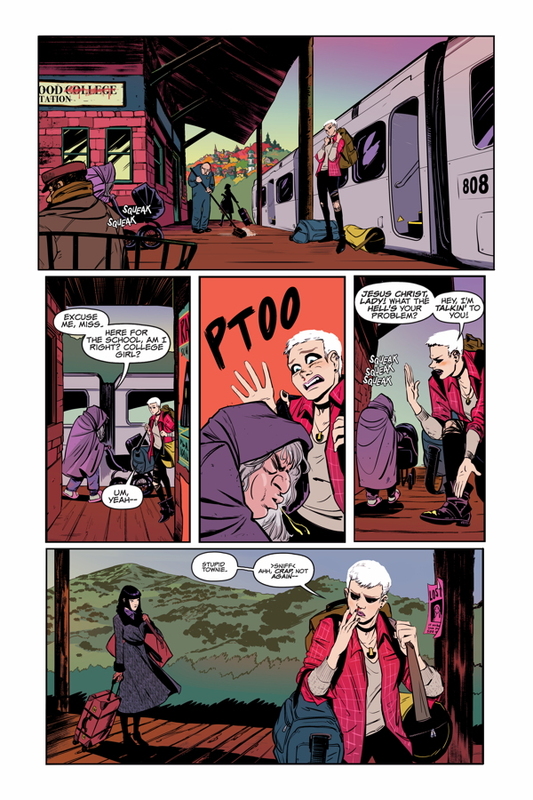 The wonderfully bewitching art for this story is provided by husband and wife team Veronica and Andy Fish (Sabrina the Teenage Witch), who also have experience in crafting visuals for horror-themed comics. One of the main reasons I’m suggesting Blackwood for an older teen crowd is due to the artwork. It’s beautifully done, but very graphic. This is exactly what you’d want from a proper horror comic — maggots spilling out of a dead person’s face or mounds of wriggling larvae engulfing a body — but it’s certainly not for the weak-stomached or faint of heart. 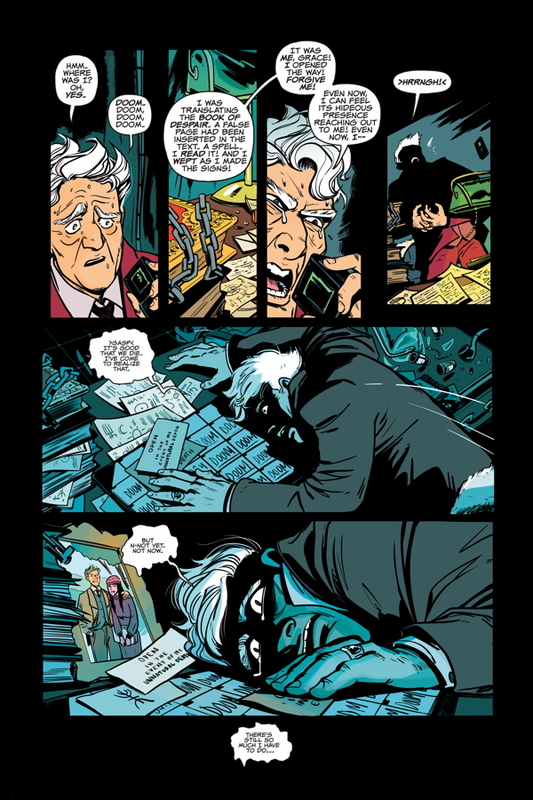 Dark but vivid coloring enhances the overall mood of the story and sets the tone nicely. They also find ways to showcase some of Dorkin’s humor, like whenever Dean Ogden’s two-headed mummy chimp appears screeching, fighting whatever happens to be in its path! And amid all this horror and fantasy, there’s mystery, humor, and even a love story — which in itself is sweet, but also macabre in its own lovely way. Overall, the Blackwood TPB will delight readers. Dorkin’s layered story is told at a measured pace, and combined with the Fishes’ complex and deep artwork, it’s incredibly easy to be consumed by this book. So this holiday season, if you know someone who isn’t quite feeling all the mistletoe and good cheer, take a chance and gift them Blackwood. Art by Veronica and Andy Fish. This book contains death, gore, and occult themes. 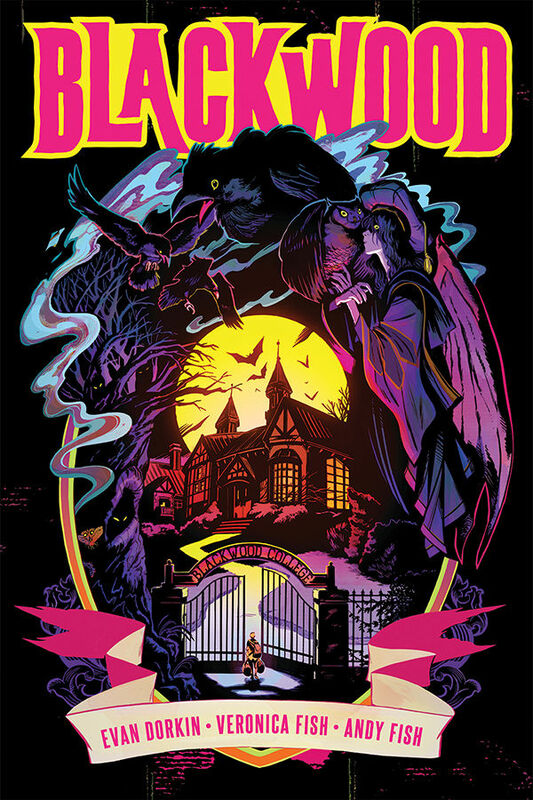 ‘Blackwood’ TPB hits stores December 12! You can order it here. Enjoy this seven-page preview of ‘Blackwood’ TPB, courtesy of Dark Horse Comics!